Everyone brings different needs and approaches to web projects, and it’s always rewarding to guide these towards a finished product which everyone is pleased with. I’ll make it easy to find out if we’re the right match for your project. Launched in October 2014, mezzo-soprano Diana Moore’s fresh new website provides her with a login for full editorial control over news, performance dates and regular content pages. The fully responsive design was achieved using the powerful Susy framework, which is currently my preferred toolkit for clean, robust CSS layouts. Cristian Grajner De Sa’s new website was launched in February 2013. The minimal, modern design is balanced with typography that adds a classic look and feel - all supported by full content management control over pages, background photos, concert dates, gallery images and video clips. Noriko Ogawa is an internationally respected pianist who commissioned me to develop a new design and build for her English language website. Special features include an interactive photo gallery combined with Google Maps and a dynamic concert diary page. The live launch in December 2011 was coordinated with the Tokyo based developer of the Japanese-language website. British classical pianist Martin Roscoe required a new website to provide well-presented information on his career and activities to fans and music industry visitors. The website is made up of static HTML pages which, for small websites requiring occasional updates, is often preferable to a full content management system. 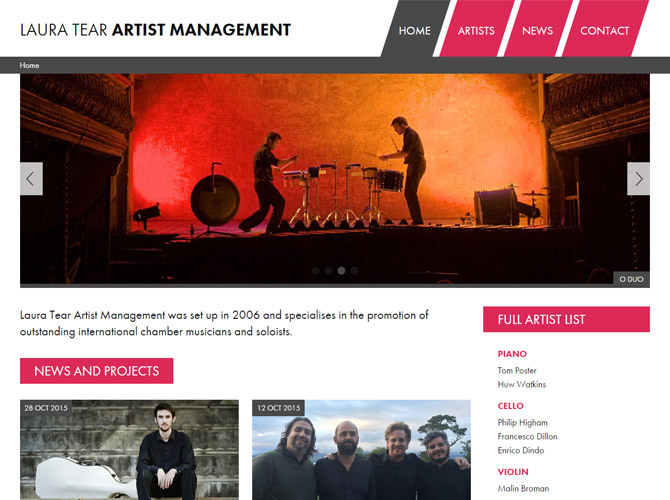 The new Perth Chamber Music website, launched in August 2010, marked my first step into HTML and CSS without the aid of tools such as Dreamweaver. 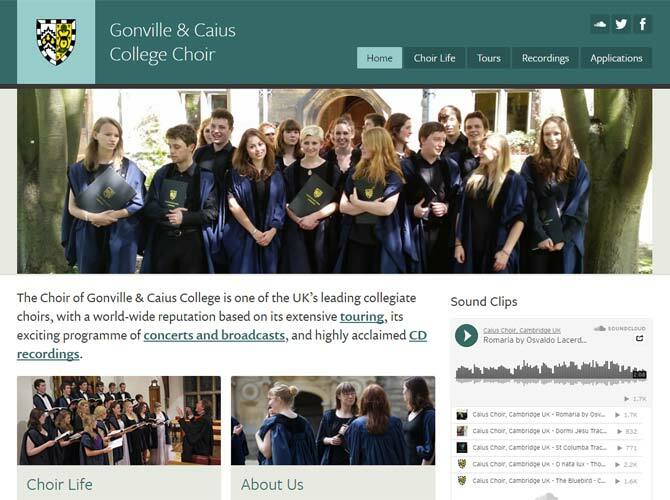 The Choir of Gonville & Caius College is one of the UK’s leading collegiate choirs, with a world-wide reputation based on its extensive touring, its exciting programme of concerts and broadcasts, and highly acclaimed CD recordings. 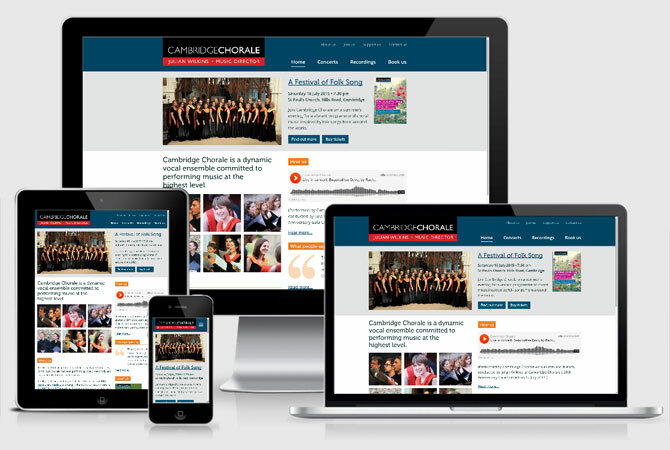 Launched in November 2015, the site provides prospective members with detailed information about choir life and the application process. Launched in August 2015, this striking new website for Laura Tear Artist Management was created in collaboration with graphic designer Phoebe Rountree. User feedback has been very positive, with artists and promoters praising the site’s usability as well as the overall look and feel. Responsive design makes the site easy to use on all devices. Launched in April 2015 following collaboration with a team of colleagues and friends in the choir, this redesign project started with a workshop in which our users’ needs were identified and prioritised. The output of this workshop underpinned the design and development of the new website, which features a secure members’ area containing a rehearsal calendar and choir roster amongst other custom tools. 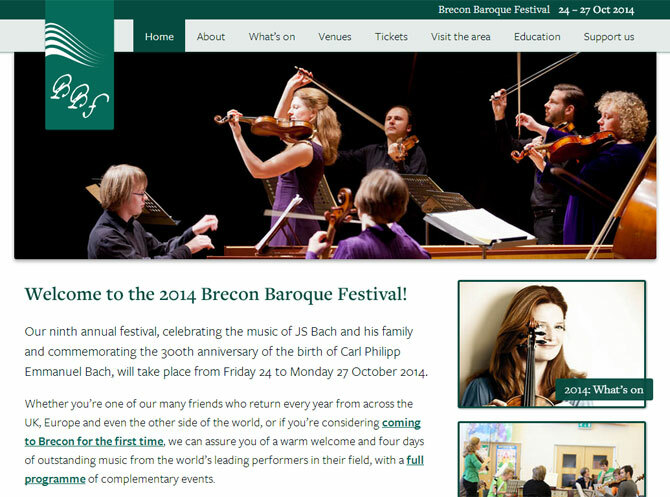 The Brecon Baroque Festival, held annually at the end of October, brings international artists to the beautiful scenery of the mountains of South Wales for four days of baroque music. Launched in June 2014, the responsive design (built to adapt gracefully to different screen sizes) provides an accessible introduction to the events and activities which make up the Festival each year. 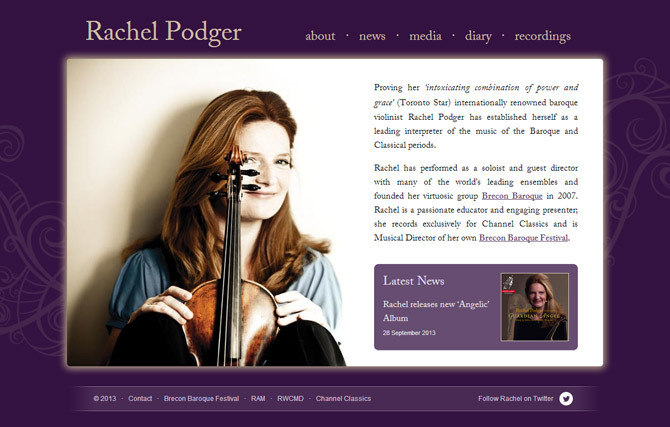 Internationally renowned baroque violinist Rachel Podger has established herself as a leading interpreter of the music of the Baroque and Classical periods. Launched in September 2013, Rachel’s new website showcases her projects, recordings, concert dates and latest news in an elegant design, set in Adobe Caslon Pro by Typekit. 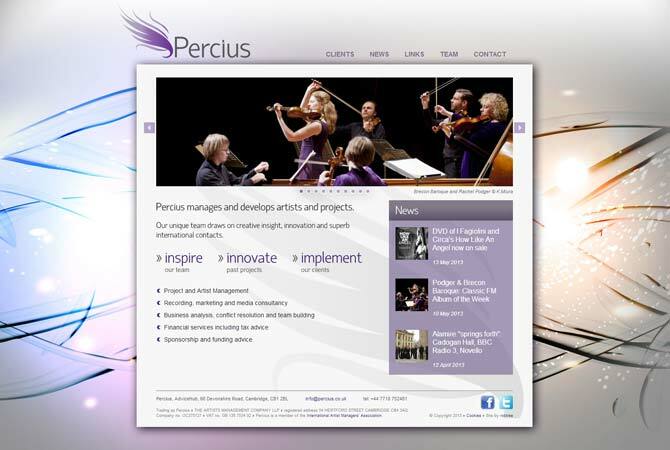 Launched in October 2012, Percius’ new website presents information on their extensive music management and consultancy work, all wrapped in a design which conveys the sense of creativity and innovation in their team. Content management has been implemented throughout every element of the site, providing the Percius team with full control to make detailed changes at any time.